Take a look at this original design from our Girls and Women collection. It features a metamorfoza girl wearing clown makeup. She’s one of those enigmatic circus performers that look so striking and unusual. 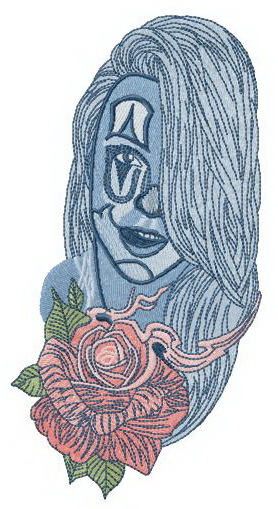 The girl is embroidered in a blue palette of varying shades. She’s holding a large rose in her hands. This highly original design is like nothing else you’ve seen before! You can use it to decorate a variety of your favorite items like sweaters, T-shirts, jackets, purses and anything in between. This application works perfectly with all sorts of suitable fabrics. Stitches out perfectly, I use VP4 version. My client loved it. Thank you!